SINCLAIR’S Z88 — Pandora’s Box? Sir Clive Sinclair has launched a £230 portable computer, the Z88. Contrary to rumours, it won’t run Spectrum software, but it is an interesting beast nonetheless. The machine comes from a new company, CAMBRIDGE COMPUTER, but it’s the product of almost a decade of development work. Uncle Clive has been plugging the idea of a portable machine since he first began making computers — in fact, his first computer concept, the NewBrain, was a portable machine. That was originally developed in 1978 by his old firm, SINCLAIR RADIONICS. Later it was sold off to NEWBURY LABORATORIES, who launched it to an indifferent world in 1982. As RADIONICS collapsed at the end of the seventies, Clive Sinclair set up a new firm, SCIENCE OF CAMBRIDGE, with Chris Curry, a star employee from his previous firm. When RADIONICS finally bit the dust, SCIENCE OF CAMBRIDGE was renamed twice — first to SINCLAIR COMPUTERS and then to SINCLAIR RESEARCH. No-one was the slightest bit surprised at this, as SCIENCE OF CAMBRIDGE advertisements looked exactly like their RADIONICS counterparts. The Sinclair link had been obvious all along. Clive has now sold his surname to AMSTRAD, but that doesn’t stop him putting CLIVE SINCLAIR (without the ‘Sir’) in large type at the top of the first page of the Z88 brochure. The leaflet follows the usual Sinclair format, just as the new company name follows on from previous titles. CAMBRIDGE COMPUTERS seems to be run on something of a shoestring. The Z88 was first revealed at a lunch for journalists at Sir Clive’s house in London. Two days later a prospective customer arrived at the firm’s Which Computer Show stand, and asked the name of the Sales Director. He was told, apologetically that they hadn’t got one! Chris Curry has evidently been impressed by the ease with which Sinclair has kept the ball rolling from one firm to another. Curry set up his own company in 1979 — ACORN COMPUTERS — and he duly left Uncle Clive after the ZX-80, to work full-time on his own. ACORN, like RADIONICS and SINCLAIR RESEARCH, had its ups and downs and was eventually bailed out by OLIVETTI. Curry abandoned ship, but he’s still in the game — he’s the man behind the Red Box add-ons which we reviewed in the Christmas Special! SCIENCE OF CAMBRIDGE avoided portable machines at first. They produced a tiny bare-board computer called the MK14, and then the ZX-80 — the first useful-looking computer to sell for under £100. The design of the Spectrum ROM is closely allied to that of the ZX-80, with the ZX-81 — which actually was useful — as an intermediate step between the two machines. In 1980 we were told that the ZX-80 “would be linked to a flat-screen display.” In May of 1981 Sinclair upgraded his promise, announcing a version of the ZX-81 with a “four or five inch flat screen”, scaled up from the RADIONICS pocket TV display... it never turned up — even in prototype form. In 1983 the QL was planned as a go-anywhere machine, with space for a column of U2 batteries along the back of the case. Portability went out of the window in the rush to get something onto the shelves, as the bottom began to drop out of the micro market. A design recognisably similar to that of the Z88 was born early in 1984, partly in an attempt to salvage ideas left over from the development of the QL and the LC-3. The low-cost LC-3 was the first, unreleased ‘Super-Spectrum’. It was scrapped in 1982, when a follow-up didn’t seem necessary, and SINCLAIR RESEARCH turned to grander designs. 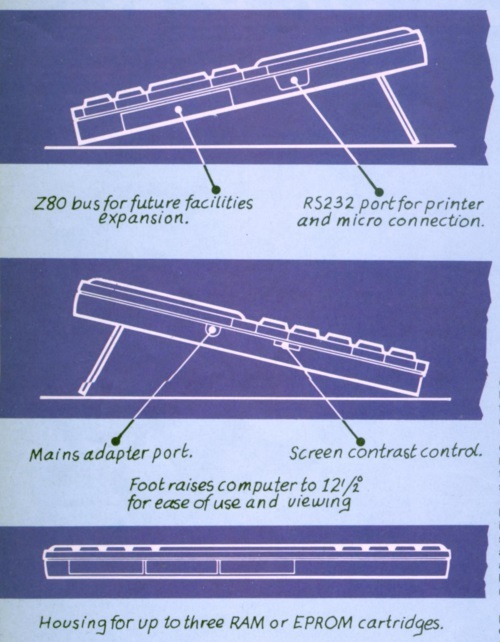 The details of the planned portable were published in February 1985, and it was scheduled for launch ‘in 1986’. At this stage the machine was based around the Spectrum design, with a Z80 processor and support for Spectrum software. Built-in business packages were promised, along with ‘bank-switched’ plug-in memory cartridges. A ‘proper light-up display’, again derived from the pocket TV, was considered essential. After a massive development effort, Sinclair engineers did manage to scale-up the Microvision display, but the result was not judged a great success. The new screen used a combination of lenses and mirrors to project a picture in the air between the lid and the base of the prototype machine. The idea was ingenious, and it worked after a fashion — but it was heavy, greedy for power, fragile, and ill-suited to mass-production... and that’s being kind! This machine was dubbed ‘Pandora’ inside the company. Like that of the ‘Loki’ proposal which I demolished in August 1986, this name was a rather obscure joke. According to ancient myth, Pandora was a character who made the mistake of opening a box in which all the evils of the world were trapped, along with one more benign quantity — hope. Opening the Pandora computer case could have released just about anything! Under the terms of his sell-out, Sinclair is required to offer future computer designs to AMSTRAD. One look at Pandora was enough to put them off — they gave Sinclair permission to go it alone. The Z88 has shed most of the outer trappings of ‘Pandora’. It retains the cartridges and Z80 processor, but has ended up with a liquid crystal display, bought in from the Japanese. The display is fairly clear, with dark blue letters on a grey background, but I wouldn’t like to use it for long. It’s very short and wide and the characters are much smaller than those of previous portable computers (like the EPSOM HX-20 and the TANDY 100). It’s quite good as LCD displays go, but it’s still sluggish, ‘dotty’ and cramped. In view of his earlier comments, I have a suspicion that Sinclair doesn’t like it much either. The LCD screen rules out Spectrum compatibility at a stroke, with its slow refresh rate and wide, short 64 x 640 pixel format. The word-processor uses eight 80 column text lines, with margins containing a menu and a ‘page map’ showing the page layout, with one dot for each character. The Sinclair deal with AMSTRAD has been suggested as another reason for the Z88’s lack of Spectrum compatibility, but I think that argument should take second place to the practical considerations. The Z88 has no output for a conventional ‘CRT’ display, and it seems unlikely that one will materialise — LCD and CRT display circuits have very little in common. 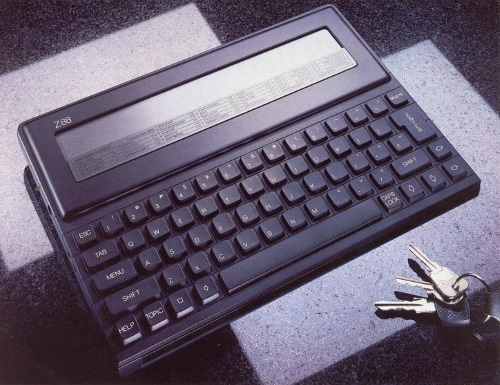 The Z88 weighs less than two pounds, and is about the size of an A4 pad. It feels light, but sturdy. It runs on four Walkman batteries, apparently for 20 hours, with about a year’s ‘stand-by’ power when you’re not actually using the machine, but still want it to retain its memory contents. These are Sinclair’s battery life figures, and anyone who has owned a C-5, Black Watch or Cambridge programmable calculator will view them with suspicion. The keyboard is weird in design, but quite easy to use in practice. It is a continuous sheet of plastic, with raised keys. The material at the side of each key is thin, so that only the key you press moves as you type. Although it seems simpler, I prefer this keyboard to that of the Spectrum Plus and the QL. It’s silent, which is a bit disconcerting, but as usual Sinclair can think of a good reason for every deviation from normality — he points out that it’s much easier to hear yourself think in a room full of Z88 owners than it is in a typing pool! I type for a living, and I’d be quite happy to use the Z88 keyboard — but this is a very subjective judgement, and I’d advise you to have a go before ordering a Z88, especially if you’re already an experienced typist. Journalists that I’ve spoken to come out about 50:50 for and against the Z88 keyboard. It seems that — as usual for a Sinclair machine — the Z88 has been launched long before it is ready. The prototype was running a neat Word Processor package, but the spreadsheet, database and diary software were nowhere to be seen. This software will have to be uncommonly reliable — there’s not much point having batteries that can preserve data for a year if the software goes haywire and scrambles things, or locks the machine up, every few days. The Z88 will run BBC BASIC — a dialect much-lauded by those who know more about fashion than they do about computer science. BBC BASIC is faster and more expressive than ZX BASIC — but it’s less friendly. A version of BBC BASIC for the Z80 processor has been available for several years, so it should not take long to get the core of it running on the Z88. It will be interesting to see how much support we get for the paged memory and LCD graphics. Will we be stuck with the 64K memory limit of other versions, on this machine which promises ‘over 3 megabytes of instantly-addressable memory’? The claims about the memory capacity of the 288 should be taken with a pinch of salt. There are slots for three ROM or RAM cartridges at the front of the machine, and 32K and 128K cartridges are promised to be available with the first machines in April, with a 1 megabyte version coming ‘soon’. That will be built around the ‘wafer scale integration’ ideas that have been kicking around Sinclair’s ‘Metalab’ for several years — but there’s no sign yet of the £6 million needed to get those ideas into production. The only standard interface is an RS-232 port, which allows access to modems, serial printers, and other computers — at least in theory. RS-232 interfacing is a black art at the best of times, and Sinclair serial interfaces have a reputation for idiosyncracy. I enjoyed reading the Z88 brochure, and — as usual — I wanted to order one as soon as I’d finished. The design seems full of good ideas, but it’s clearly not finished yet. CAM BRIDGE COMPUTER are talking about production levels of 10,000 machines a month, but this is a pretty meaningless figure, as it’s the usual ‘minimum order’ quantity for mass-production of computers. I’ll be pleased, but surprised, if Sinclair can sell Z88’s in respectable numbers. EPSOM, NEC and TANDY have all attacked the A4 portable computer market and found slim pickings. The appeal of a portable computer has been clear since XEROX came up with the idea of the Dynabook, long before the personal computer industry existed. The Z88 is a step in that direction, and will doubtless appeal to some people, but the product hardly lives up to the slogan, ‘full-facility, no-compromise computing’ at the moment. It’s especially sad that Spectrum compatibility has been ruled out, because that could have given the Z88 the mass-market appeal that it presently lacks. But Sinclair is still a man to watch, and — rest assured — CRASH will keep watching. STOP PRESS... Amstrad have announced a Spectrum Plus Three. This will have one built-in disk drive in place of the Plus Two’s cassette, and an operating system written by Locomotive Software, the firm’s tame programming house. At the time of writing (early March) there’s been no sight of a finished product, although that hasn’t prevented less reputable magazines than CRASH from getting their crayons out. The word is that boss Alan Sugar has given the development team until the end of March to sort out the design. We’ll bring you all the facts, and intelligent analysis, as soon as the new machine materialises.